This year marks the 91st anniversary of the August 23, 1927 execution of Nicola Sacco and Bartolomeo Vanzetti, both immigrant working-class activists and anarchists. We call your attention to two events being held next week in their honor. 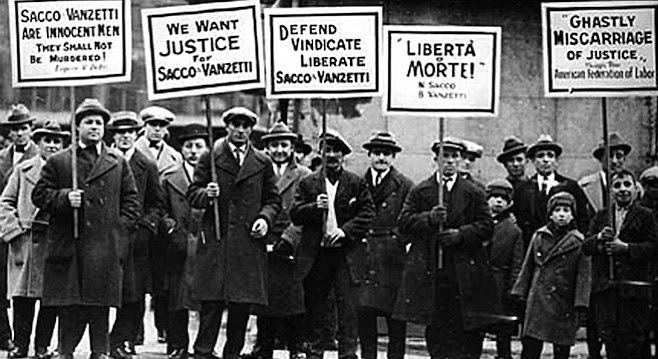 On Wednesday, August 22, 2018, the Sacco Vanzetti Commemoration Society and the Dante Alighieri Society of Cambridge, will host "We Still Remember… A look at the case that rocked Boston and the world from 1920-1927." 7:00 p.m. at the Dante Alighieri Auditorium at 41 Hampshire St. Cambridge, MA 02139 (details below). And, on Saturday, August 25, 2018, encuentro5 will host an international gathering of activists challenging political repression - 7:00 p.m. at 9A Hamilton Place, Boston, MA 02108. Wednesday, August 22, 2018, 7:00 p.m.
encuentro5 honors Sacco and Vanzetti with presentations from on-the-ground activists in Chile and India and material from the forthcoming A People's Guide to Greater Boston. To learn more about the case, read Felix Frankfurter's contemporary critique of the case and Avi Chomsky's description of working-class activism in Linked Labor Histories (print copies of the relevant chapters will be available at the event). Saturday, August 25, 2018, 7:00 p.m.